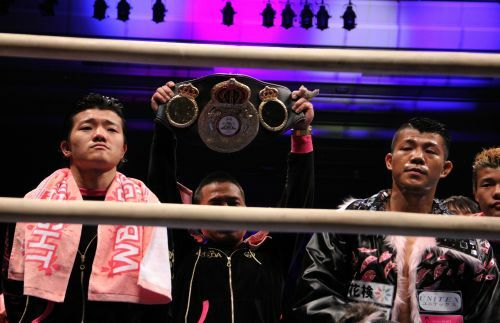 WBA Bantam Champ Koki Kameda (30-1, 17 KOs), 118, barely kept his title as he eked out a split decision over Thailander Panomroonglek Kaiyanghadaogym (36-2, 19 KOs), 117, over twelve sizzling rounds on Sunday in Osaka, Japan. The official tallies were as follows: Ruben Garcia (US) 115-113, Michael Lee (Korea) 115-114, both for Kameda, and Derek Milham (Australia) 116-113 for the Thai challenger. The referee was Raul Caiz Sr. (US). It was a contest of fast southpaws. Kameda, making his sixth defense, showed a good start, but absorbed a very effective uppercut and almost lost his equilibrium midway in round two. The champ, three years his junior at 26, was in command in the fourth, but began streaming red ribbon from the nostrils due to the challenger’s penetrating jabs. Panomroonglek threw sharp jabs to dominate the fifth, while Kameda connected with body shots to be in command in the sixth. It was the Thailander that controlled the seventh through ninth sessions with his fine display of southpaw jabs and good pressure. Kameda, whose face was puffed and later swollen with the challenger’s jabs, scored with counters to take the tenth, but Panomroonglek apparently won the eleventh. Kameda desperately dominated the twelfth and last session, which eventually made him keep the belt in the unexpectedly tough defense, in which the champ showed his heart. Kameda said, “I feel sorry to have shown such a poor performance. I wanted to display a better fight.” The Thai group sstrongly claimed a victory and asked for a rematch. Ex-world challenger Hiroyuki Hisataka (22-10-1, 10 KOs), 115, scored an upset unanimous decision (98-94 twice, 96-94) over former WBC flyweight ruler Sonny Boy Jaro (34-12-5, 24 KOs), 114.5, over ten. Hisataka, whose body attack was effective, took the initiative all the way, while Jaro occasionally fought hard in the closing seconds of some rounds, which wasn’t enough to win a verdict. WBC top ranked 105-pounder Denver Cuello (33-4-6, 22 KOs), 107.75, floored Japanese veteran Takashi Kunishige (24-9-2, 2 KOs), 108, in the second, but couldn’t follow up hard only to win a majority decision (96-93, 97-92 and 95-95) over ten.